Catalysis: the increase in the rate of a chemical reaction due to the participation of an additional substance called a catalyst, which is not consumed in the catalyzed reaction and can continue to act repeatedly. In general, reactions occur faster with a catalyst because they require less activation energy. 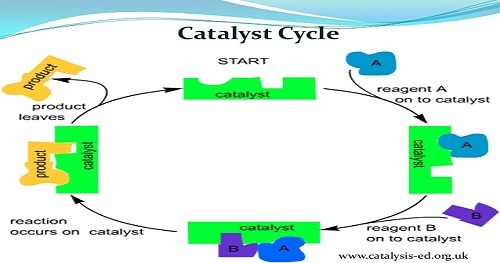 In catalyzed mechanisms, the catalyst usually reacts to form a temporary intermediate which then regenerates the original catalyst in a cyclic process. Catalysts work by providing an (alternative) mechanism involving a different transition state and lower activation energy.